One concept I've borrowed from Thomas Newkirk's excellent "Speaking Back to the Common Core" is the idea of mystification. We are already seeing at work a process I call "mystification"--taking a practice that was once viewed as within the normal competence of a teacher and making it seem so technical and advanced that a new commercial product (or form of consultation) is necessary. He called that one in 2013, and we've seen it ramp up steadily since. We've seen it used for consulting (you need to hire somebody to come in and show your teachers how to "unpack" the standards) and for testing (parents and teachers have no clue how the student is doing until they see standardized test results). We even see it as a textbook marketing strategy (you'd better have somebody from the publisher come train your teachers in how to use the new textbook series because, you know, textbooks are hard, and they're only teachers). But all of that was mystification of the curriculum and content. Reformsters are inching across a bold new boundary when it comes to mystification. They are mystifying the personality of children. We've been playing with NCS for a while, most notably with the new science of Grittology. Our basic premise is that there are non-content skills or abilities or traits that determine a child's future success just as well or better than the child's ability to perform like a well-trained monkey on a standardized test. Sometimes we fall back on old words like "character," but most of the discussion has been in the vein of the Brookings report that asserts that A) character is important and B) poor people don't have it so C) that's why they're poor. But these discussions of NCS have generally been about blame. Students fail because they lack character and grit, so it's pretty much their own fault (well, theirs and their teachers') and society has no obligation to provide support or resources or any of those things that require money. The things is, though, there's plenty of real research that NCS are actually important (plus anecdotal evidence from every single human being who ever worked with other human beings). The folks who are building that cradle-to-career pipeline are aware that NCS are are part of the grease that will keep the pipeline running smoothly, so we have got to talk about these non-cognitives as something other than an excuse not to help poor people. So here comes one notable attempt to fill that gap. 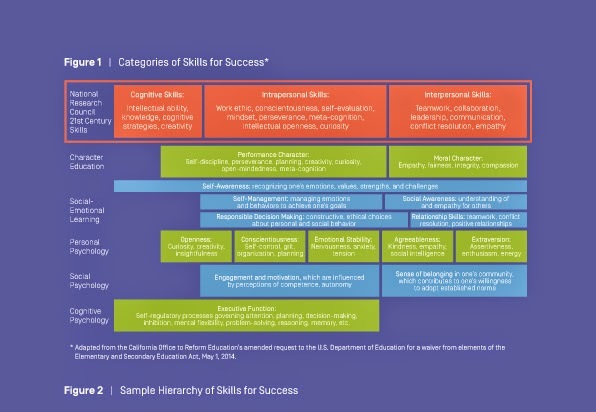 Working for the folks at New America, Melissa Tooley and Laura Bornfreund have authored "Skills for Success: Supporting and Assessing Key Habits, Mindsets, and Skills in PreK-12." What is New America? Their education policy wing is funded by, among others, the Joyce Foundation, the Gates, Lumina Foundation,the Annie E. Casey Foundation, and the William and Flora Hewlett Foundation. The latter footed the bill for this particular report. Skills for Success: Why Care (or Assess)? They note that SFS are often imparted in pre-K, but not so much in K-12, noting that some people would argue this makes sense because these can only be instilled early in life. No, say the authors-- people are malleable and we could totes develop these into young adulthood (the authors have done yeoman's work in avoiding the verb "teach" when it comes to SFS). The Big Leap appears to be the hallmark of Tooley and Bornfreund. Right after saying that there are "some promising approaches available" for supporting SFS growth, they declare, "one thing is clear: school and classroom climate can either help promote or deter the development of SFS." So, from promising to proven in just a few sentences. To be effective, any SFS approach must be clearly aligned with local needs and goals and be implemented with fidelity. A system of assessments can help achieve these goals. Needs assessments can help inform decisions about strategies to reach SFS goals, while implementation assessments can provide feedback on the quality of strategy implementation and the level of progress associated with those strategies. Well-run schools are already using these types of assessments in other areas to ensure that they are helping move all students toward their full potential. They allow that SFS assessment is an imperfect science at the moment and "it may not currently possible to assess certain skills at all." But that's no reason not to assess. What do they propose doing with the assessment? Nothing that directly impacts the student-- for instance, no pass-fail a grade decisions based on the students' standardized Are You a Jerk or a Nice Person Test (Pearson pat. pending). However, "since schools and teachers can positively or negatively influence the development of students' SFS, teacher observations and school environment ratings should--over time--be incorporated into educator and school accountability systems, Pre-K-12th grade." The paper comes with recommendations. For the feds, they recommend 1) more money spent on experiments in fostering and assessing SFS, 2) promoting a more holistic approach to school evals, 3) encouraging shift in teacher focus, and 4) promote more holistic student evaluations that include formative information for teachers, parents, and students. Let's go back to the chart and look at some of the specifics they include. We have empathy, integrity, and compassion. Self-awareness, self-regulation, and responsible decision making. If you want to be sure to freak out your conservative friends, use this one: "Sense of belonging in one's community which contributes to one's willingness to adopt established norms." We are really talking about character, personality. We are asking, "Is your kid a the right kind of person?" There are really two issues here. The first is an old one-- we'd like schools to teach children to be decent human beings, but we're not sure we'd like schools to decide what that means. This is not new, nor are the controversies that go with it. The authors acknowledge that there's liable to be some pushback, that the same people who feel Common Core is some sort of indoctrination program are probably not going to be delighted to hear that the school is trying to teach their child "proper values." But this is an issue as old as the hills and generations of "values" education. The second issue is the new one. Because what we're saying here is that parents and teachers need to see test results in order to know whether or not a child is kind or not. This report suggests that parents and teachers are sitting, twiddling their thumbs, thinking, "Well, I think Chris is a pleasant, kind, decent kid, but I guess I won't know till I get the Pearson SFS Test results back." It imagines a teachers lounge conversation that includes, "You know, I thought that Jenkins kid was all right, but I just got his test scores back and apparently he's kind of a jerk." It's true that adult evaluations of children are not always spot on. Mrs. Cleaver thought Eddie Haskell was a nice boy. Of course, if you don't think Eddie Haskell could totally game whatever SFS test was thrown at him, I have a unicorn farm I'd like to sell you. This is one of those reformster ideas that is so stunningly dumb that it's hard to grasp. But let's say it again-- these folks are proposing that parents and teachers do not know what kind of people their children are unless some expertly produced standardized test tells them! Teachers will stumble through the first several weeks of class, and when someone asks them what kind of class they have, they'll just shrug and say, "I have no idea. I'm waiting to get their scores back." Parents will look at their three year old and say, "Boy, I can't wait to send this kid to school so he can take that test and we'll know what kind of person we're raising." This is beyond mystifying the content and academics of school. This is mystifying the personality of children. This is saying that teachers and parents lack the qualifications to make judgments about the personality of a child, and that they must call in the experts to answer the question, "What kind of person is this?" The only thing that rescues this idea from total dumbosity is that, in the end, it's just a cover story. Well, two things. The first thing is that they can't do it. Because if there were great SFS assessment tools, people would be using them. Somebody would be getting rich using it in an on-line matchmaking service. Employers would be using them to scan every potential employee. And that's our big hint. 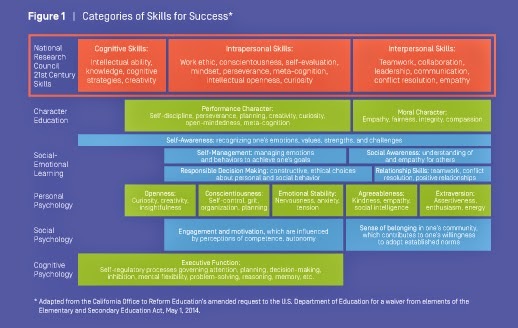 Remember-- we agreed way up front that these skills really do matter for employment success. The reformsters do not want to give these students a standardized Are You A Good Person test in order to share the data with parents or teachers. The main market for that information would be the employers waiting at the other end of the cradle to career pipeline. That pipeline will be working smoothly when "applying" for a job just means letting an HR department click on a link to your permanent on-line file that includes your math and English scores since you were three, side by side with the scores that indicate whether you're too nice, not nice at all, or just nice enough. Imagine the day when you can't get hired because of your personality test results from fourth grade. To get the cradle to career pipeline up and running and fully useful to corporate human resource departments, it needs to include a complete picture of each future drone, and that means all your SFS scores as well. My slightly paranoid, somewhat cranky and non-compliant side (at least, I think I have that side-- it's hard to know what kind of person I am without a professional standardized test analysis) thinks that THAT is the purpose of all this noise, and the reason we're going to hear how schools must foster and test-- but mostly test-- these very important skills.